If you see a blinking “Start Survey” button on the right please click it to share your opinions on issues important to technology industry decision makers. At the end of the survey you will be asked to enter your email address and we will contact you within 24 hours to arrange to send you $15 via your choice of PayPal, Amazon or Visa gift card. Gregory, a 5 year old boy from Orange County, has been suffering from a brain tumor since 2014. Despite the heartache and disruption this has caused in his life, he still finds joy and happiness that all children deserve to experience in childhood. One thing that brings him a great deal of joy is farms and tractors. Gregory loves to learn about farms and watch shows about them on T.V. One of his dreams has always been to ride a tractor. Recently, the Make-A-Wish team in the United States was able to make this dream come true for Gregory. Gregory and his family were able to spend a fun-filled day at The Original Manaserro Farms. He was treated to many special things, but the most exciting thing that he got to experience was being able to drive a tractor. Everyone involved in this wish being granted could feel the joy and happiness that Gregory felt. Too many children like Gregory have to experience pain on a daily basis. The Make-A-Wish Foundation is able to grant wishes, like Gregory’s, and take that pain away for a little while and replace it with joy. PJ, a young man from Canada, was granted a life-changing wish through Make-A-Wish® Toronto & Central Ontario. PJ has battled a type of cancer called Hodgkin Lymphoma. This disease has kept him from doing the normal everyday things that a typical teenager would do, but it has not kept him from his passion for politics. PJ’s dream is to one day become the prime minister of Canada. The Make-A-Wish foundation made this dream come true sooner than PJ could have imagined. Many people came together to plan a very special week for PJ. His trip began by being flown to Ottawa, where he was made honorary Prime Minister during the week of his wish. Throughout his stay in Ottawa, PJ had the pleasure of meeting the Prime Minister of Canada himself, Justin Trudeau and many other influential politicians. He had his own security detail and got to stay in the presidential suite at the famous hotel, Chateau Laurier. Thanks to the Make-A-Wish® Foundation, this was a magical week for PJ and his family. PJ described the experience as his version of Disneyland. At Pivotal Perspectives® , we are proud to support the Make-A-Wish® International Foundation..
Meet five-year-old Balun. He lives in Hong Kong and is suffering from end-stage renal failure. One of Balun’s favorite things to do, is have his parents tell him stories of superheros. The Make-A-Wish team in Hong Kong was able to plan a day for Balun that included meeting his most esteemed superhero and going on a special mission. Balun got to dress up in a superhero costume, catch all of the “bad guys”, recapture the magic, and save the earth! He got to be a real superhero! For one day, Balun was given the chance to escape the world of sickness, and become the superhero that he dreamed of being. Many people came together to play the parts of different characters and act out battle scenes involved with the mission. Balun experienced so much happiness and pride that day, as did his family. The Make-A-Wish® International Foundation helps to make the wishes of children with incurable illnesses come true, all over the world. The Make-A-Wish® Foundation began in the United States in 1980. Today, the Make-A-Wish® International Foundation reaches countries and children all over the world. This amazing program helps make the wishes come true of children with life-threatening medical conditions. Pivot Point Research is proud to support this foundation, and children all over the world. This week’s Make-A-Wish story comes from a young girl in Brazil. Nine-year-old Camila, diagnosed with malignant cerebral neoplasm, dreamed of being a real princess. She didn’t want to be just any princess though, she wanted to be a warrior princess. The Make-A-Wish team in Brazil made this dream a reality for Camila. A very special day was set up for the young girl, a day where she would feel like hero, Princess Valiente. Camila’s dream day began with an archery class. She learned how to use a bow and arrow and hit targets. Next, Camila went to a stable where she learned to ride a horse, just a like a real warrior princess! After a special lunch filled with more surprises, Camila got to go on a carriage ride. The day was a dream come true, a day where Camila was transported to another world, far away from the one of pain and suffering that she was so used to. There are many children just like Camila, wishing to experience their dream become a reality, if only for just one day. By taking part in one of our surveys. a donation will be made to the Make-A-Wish® International Foundation. Meet Matthieu, a 6 year old who livse in Calvados. 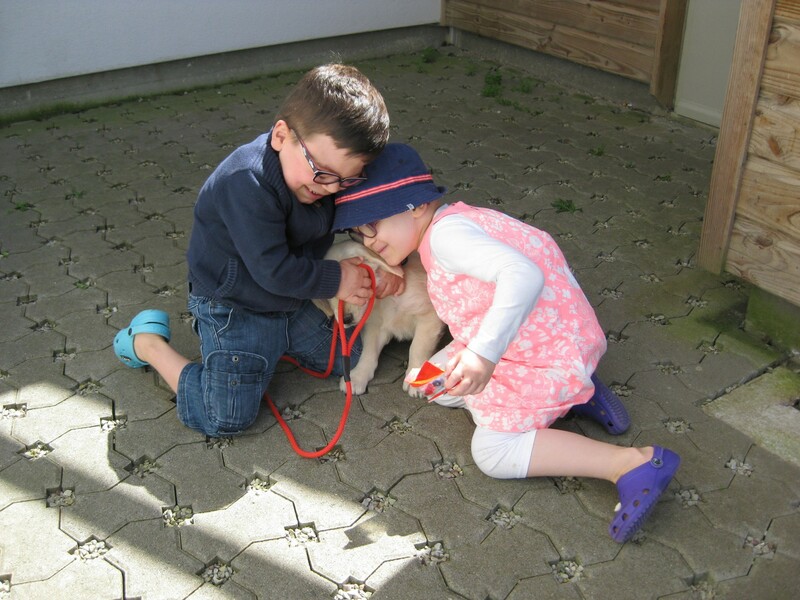 The Make-A-Wish program in France made Matthieu’s wish come true by giving him the gift of his very own dog, a Labrador retriever named Lotus. When the Make-A-Wish team arrived with the new puppy, Matthieu was very surprised! He hugged the little dog at great length and couldn’t believe that he finally had the dog he always wanted. Along with the dog, Matthieu was given all of the things necessary to take care of a it properly. His father even built a dog house for the new family member! There is no doubt that Lotus will be well-loved by Matthieu and his family. Lotus will also be a tremendous comfort to Matthieu as he continues his treatment. Pivot Point Research is dedicated to helping children all over the world like Matthieu to realize their wishes through the Make-A-Wish-International-Foundation® . Each time you complete a survey, a donation is made to this life-changing organization. No matter how big or small you may be, old or young, everyone has a dream. Carter, a seven year old from Australia, has a strong passion for all things prehistoric. He dreams of one day becoming an archaeologist and researching dinosaurs. Carter is battling Burkitt lymphoma, and when the Australian Make-A-Wish team visited Carter, he wished for a dinosaur adventure. Carter and his family got to experience the trip of a lifetime when they traveled to rural North Queensland to Australia’s world heritage-listed Dinosaur Trail. Carter was given his own paleontologist outfit to wear and got to dig for ancient bones and assemble his very own miniature skeleton of a T-Rex. Carter was given the incredible opportunity to experience what the world of archaeologists and dinosaur discoveries is really like. This is just one of many Make-A-Wish stories from all over the world. By working with Pivotal Perspectives, you are helping to make the wishes of children with life-threatening diseases become a reality. When you complete a survey, a donation is made to the International Make-A-Wish Foundation® .